Gap Mangione calls his new big band CD Stolen Moments, after the classic Oliver Nelson composition reworked therein. Indeed, all the tunes in this wonderful new disc have their origins elsewhere. They come from recordings by Nelson, the Beatles, Eddie Floyd, Henry Mancini, the Turtles, Nat King Cole, Simon & Garfunkel, and Cannonball Adderley from the 60’s. And, just for good measure, Gap finds new approaches to a couple of tracks from his own earlier recordings. Thanks to what Gap’s imaginative, swinging musicians do with this first-class material, you’ll realize the songs have all been marvelously reinvented as Mangione Moments. 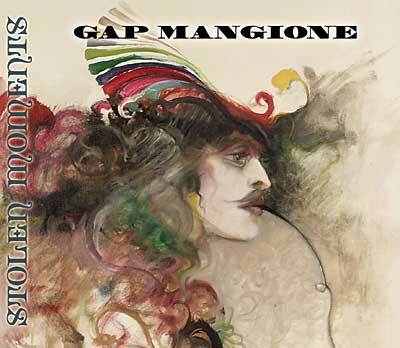 Gap Mangione’s considerable skill as an arranger, a band leader and a pianist are amply on display. Not many musicians can make straight-ahead jazz by Oliver Nelson and Jimmy Heath coexist so delightfully with Stax soul music, a Simon & Garfunkel folk song and a Henry Mancini ballad. And the Beatles haven’t had such a bountiful big band boost since Count Basie took on the Fab Four’s music in the 1960s. Then again, Gap Mangione is the guy who put the swing in our nation’s pastime with “Take Me Out to the Ballgame’’ in Planet Gap. To tackle such diverse material, you need skillful musicians who are capable with good music of all sorts -- and who have the ability to put their own signatures on it. That’s true of the members of Gap’s hard-driving big band, as well as the handful of guest artists who elevate the game even further with their unique skills. Nearly all have been part of Mangione music, on and off, for many years. Two of the best who return for Stolen Moments are drummer Steve Gadd and bassist Tony Levin. Gap was one of the first to employ their skill as his rhythm section in Rochester in the 1960s and was one of the first to record them on his recently reissued 1968 disc: Diana in the Autumn Wind. Since then, Gadd has gone on to be the bedrock for music by Paul Simon, Eric Clapton, and Frank Sinatra -- just about any musical giant looking for exquisite taste, time and talent. Ditto Tony Levin who has been a backbone for Peter Gabriel, John Lennon, Gary Burton and many others. Levin put the crown on King Crimson. Gap has also long been aware of the talents of saxophonists Joe Romano and Gerry Niewood and guitarist Grant Geissman. Romano has frequently been part of Gap and Chuck Mangione’s music for decades. Niewood has shared friendship and musicianship with both Gap and Chuck Mangione since childhood and Grant has contributed mightily to some of Chuck’s best music. Gap’s loyalty to talented longtime friends extends beyond the bandstand. Once again, the fantastic artwork of longtime friend, Ramon Santiago (1943-2001), graces the cover of his new CD as it did on Planet Gap and Ardis. Then there’s his rip-roaring romp through “Big P,’’ a clear indication of Gap’s vigorous mainstream jazz roots. Gap Mangione’s Stolen Moments shines the spotlight on the joyful delights of big band music Mangione style, performed with great imagination and musicianship by a group of world-class players. The players in my Big Band; Steve Gadd; Tony Levin; Gerry Niewood; Grant Geissman, for your music, studio and good advice; Lydia Geissman, for that wonderful dinner party and evening on the patio; Larry Swist, for all of your help and friendship. To Neil Leach, for making this possible; Simon Climie; Peter Morticelli; Dan Hanley; Peter Heinrich; Jon Heinrich; Peter McCrossen; The Lodge at Woodcliff. To Ramon Santiago (1943-2001), who is in my heart every day. And to my wife Janet; my son Jason Mangione; my daughter Ardis & Steve Lindley; my brother Chuck Mangione & Ro; my sister Josephine & Fred Shank; and Mom, with love.